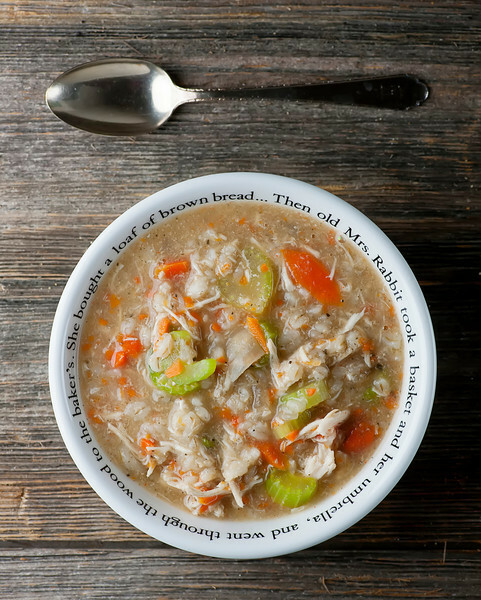 This super-duper-easy recipe brings together a few of my favorite things, namely tender chicken, sweet veggies, good-for-you barley…and my beloved slow cooker. It’s one of those recipes that is so ridiculously easy that it feels like magic when you toss everything in and it comes out of the slow cooker as a wonderful concoction of warm and wonderful soup. It’s the perfect thing for chilly, busy winter days. I based this recipe on one of my all time favorite slow cooker recipes, my beloved beef barley soup. But in this case the beef was replaced by boneless chicken breasts (and feel totally free to replace those with chicken thighs if you are more of a dark meat person), and chicken broth instead of beef broth. Both of those get tossed in the slow cooker along with some pearl barley and some chopped onion, with a dash of poultry seasoning. Cook it on low for about 8 hours and then come back. By then the chicken will be so tender it is falling apart…scoop it out, shred it into bite-sized pieces with two forks and pop it back in. Now cook some chopped carrot and celery in the microwave until they are tender and stir them into the soup. All that is left to do now is season it to taste with salt and pepper and dish it up. Needless to say, this also makes amazing leftovers. 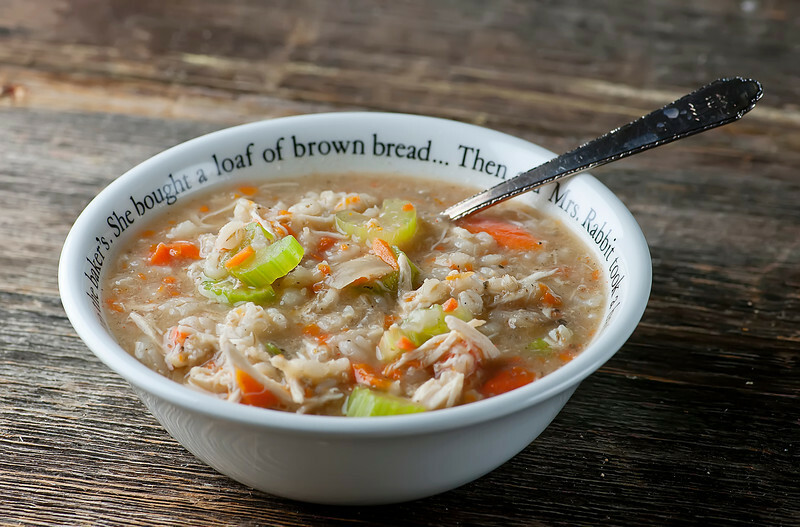 It will thicken up a little in the fridge as the barley absorbs more of the broth, but you can thin it down as needed with more chicken broth or water. So there you have it – a perfect, easy, delicious winter soup, with thanks once again to the trusty slow cooker! Combine everything but carrots, celery, salt and pepper in slow cooker and stir to mix. Cook on low for 8-10 hours. Remove chicken with slotted spoon, shred into bite-sized pieces with two forks and return to slow cooker. Put carrots and celery in microwave-safe dish with about 1/8 cup water. Microwave for 4 minutes. Add carrots and celery to soup . This is definitely chicken soup for the soul!! Wondering why you wouldn’t put the carrot and celery in to the pot earlier? Wouldn’t it add more flavor? And I just made the beef barley soup last night (or shall I say yesterday morning). Well, you might have to wait a few hours but if you start now you could have it for supper tonight! Trying this tonight. However, I realized that I bought quick cooking barley. Do you think that will still work? It should – but just to be safe, if you can add it half way through the cooking time, it might keep it from being too mushy. I actually use more broth (@ 7-8 cups) and it still really is more like a stew than a soup.